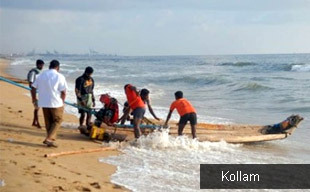 Gala of Goa and Kerala Beaches Tour is a two week long celebration along side the best beaches of India. This celebration begins from Delhi and takes off to the celebrated state of beaches, Goa. Three days in the beachside Goan hinterlands offer a perfect way to rejuvenate and relax under the shade of a tropical sun's warmth. On day 4, this blissful journey takes a U turn towards Mumbai for connecting flight to the God's own country, Kerala. This thin green strip alongside Arabian Sea is a perfect destination for incredible experiences in India. Besides relaxing on the alluring Kovalam beach, you get a chance to explore the handpicked Keralan experiences in the form of bewitching backwaters of Alleppey, wishful wildlife reserves at Periyar, spice markets of Kumily, and sweet reminisces of Munnar hill station. Transfer to the airport to connect flight to Goa. Goa is one of the prime tourist destinations of India where tourists get a chance to laze under the soothing and gentle sun alongside the mighty Arabian Sea. The state of Goa is gently jovial; thanks to the laidback Portuguese shades in its cultural fabric. People come here to bask in glory of Goa and its best-kept beach secrets. Some of thsem are swarmed by tourists throughout the year; other’s are private beach retreats ideal for spa and healing therapies. For noise lovers, pubs, casinos and bars are here in full swing and for peace lovers; there are quaint Portuguese convents and churches, adding on to the flavours of Goa. Upon arrival, you will be assisted by an Incredible India Tour Representative for smooth transfer to the hotel. On Day 2, enjoy the wholesome sightseeing of Old Goa, famed for its quaint convents, cathedrals and churches. Prominent churches to look forward in this part of Goa are Se-Cathedral, Church of St. Francis Xavier, St. Catherine's Church and Arch of Viceroy of Goa. Miramar, one of the most visited beaches of Goa is located on the confluence of River Mandovi flowing into the sea. Visit another Goan landmark, Dona Paula fishing village on the tip of Panaji, the state’s capital. The site is famous for two statues of a man and a woman, mythically referred to as Dona Paula and her lover. The site presents a real amalgam of Goan heritage. After such an exhilarated day, relax during the overnight stay at hotel. 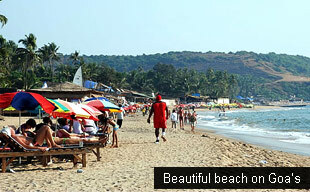 Day 3 brings a complete Goan beach experience where the day is entirely free to plan your own activities. You can choose to be on the surf of water sports, relax on the lazy beaches or rejuvenate with the therapies of spa on the alluring beach as a private luxury. Dinner & overnight stay at the hotel. After three days of celebration on the beaches of Goa, it’s time to head towards another alluring beach destination of India, Kerala. On Day 4, you will be transferred to airport for a connecting flight to Mumbai. From Mumbai, board a flight to Cochin / Kochi. The entry point to God’s own country, Cochin has a timeless character and a great enduring culture of its own. This day, you get a chance to explore various shades of Cochin / Kochi in great detail. Coated with green carpet, this city is the commercial capital of Kerala and has one of the world’s finest natural beach harbours. Cash on the opportunity to spot the gigantic Chinese fishing nets or Cheena wala on the entrance of the harbour. Gifted by the Chinese as a novel technique of catching fish, these fishing nets are very much a part of city’s livelihood and cultural fabric. 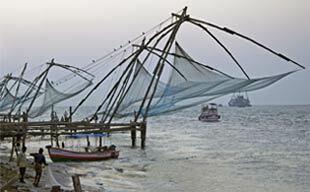 One who visits Cochin cannot resist the alluring charm of these Chinese fishing nets. One of the picturesque moments in Kerala, these fishing nets even offer you a chance to purchase freshly caught fishes and can be relished at the street food joints who can cook it according to your preference and taste. After exploring the spice route to taste and markets, relax during the overnight stay in Cochin. Later this day, visit Jewish Synagogue and Mattancherry Place. In the evening, enjoy the cultural delights of Kerala with a Kathakali narrative performance. In the morning, leave for Munnar, a hill station on the confluence of three rivers - Madhurapuzha, Nallathanni and Kundaly. After 4.5 hrs drive, pave your way to Munnar through tea plantations. On arrival to Munnar, check in at the hotel. Towards the noon time, experience the boat ride in Kundala lake. Overnight stay in Munnar. In the morning, visit Eravikulam National Park, the home of Nilgiri Tahr and other exotic species of fauna such as mongoose, elephants, otters, squirrels, etc. Later half of the day, explore the local sights of attraction including Echo Point, Photo Point and the picturesque Attukal Waterfalls. In the evening, visit the bazaar of Munnar. Overnight stay in Munnar. On Day 8, a 3 hr drive takes you to Periyar (100 km) and on arrival, check in at hotel. 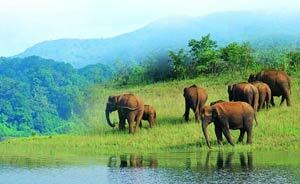 Afternoon: Boat ride in Lake Periyar to watch wildlife bounties at Periyar Wildlife Sanctuary. Later visit Kumily spice market to see, smells whiffs and purchase spices. Overnight in Periyar. Early Morning: Drive to Kottayam (120 kms/03 hrs) and on arrival, switch over from the motor car to the waterways of Kerala to a Kettuvallam or Houseboat. In this eco friendly mode, you will be cruising along the backwaters of Kuttanad, a paddy cultivated village of Kerala. Prominently famous as the rice bowl of Kerala, this region offers delightful backwater experience till Alleppey over an overnight stay in the houseboat. Disembark from houseboat at Alleppey and drive to Trivandrum (151km/04½ hrs) and on arrival in Trivandrum, check in at the hotel. In the noon time, visit Napier Museum, where you can discover the rich glimpse of Kerala's artistic and cultural heritage. The paintings of a celebrated painter, Raja Ravi Varma in the art gallery are the most popular specimens of this museum. Later this day, visit the richest temple in the world, Sree Padmanabhaswami Temple. Leave Trivandrum for an ultimate beach experience in Kovalam (35 km), one of the prominent beaches of Kerala. The paradise of the south, Kovalam features a series of three beaches separated by rocky outcroppings. Together, these three beaches look like gem studded crescent shaped garland. The alluring setting of Kovalam provides three beaches namely, Lighthouse, Hawah and Samudra as a perfect backdrop to relax, laze upon and rejuvenate while undergoing the special spa therapies, indigenous to Kerala. On day 1, discover the bounties of this beach freely. Another day comes to you as a blessing from the celebrated beaches of Kovalam. Just soak the pleasures of spending the time in leisure at the best kept beach of the state. As the tour comes to an end, you will have a celebrated experience of spending a fortnight on the best Indian beaches. Leave Kovalam for Trivandrum Airport (25 km) for a flight to Mumbai. On arrival in Mumbai, assistance at airport and transfer to hotel for wash and change. Rest of the day is free for last minute shopping/packing in the metropolitan Mumbai. In the evening, enjoy your farewell dinner and depart Mumbai on an international flight connecting your onward destination.